My problem is when converting from BSP to static mesh, after converting there is strange shadows on surfaces, which also damaging texture quality. How can this be fixed or maybe there are some converting settings exist, which I didn't found yet? After I tried to reduce sides count from several hundreds to several dozens, UE4 managed to create static mesh properly without any issues with lightmap. Also MrGoatsy thank a lot for clarifying the name of the issue for me. I wasn't able to find proper info about this, because I couldn't understand what exactly should I search for. Now with your help I understand the topic "lightmap generation during static mesh convertion". I searched answerhub and forums for this topic and found out that this was known issue and maybe it will be fixed, maybe not. Anyway for now I found proper pipeline to continue my work, thanks. Using cylinder meshes created in UE4 gives weird lightmaps, I suggest going to a cylinder with less sides or creating it in an external 3D program. External 3D program of course should solve any kind of issues, but that would be unnecessary work for me, because for all my needs UE4 tools works perfectly ok. And I suppose if feature present in engine, it should work without any kind of stange behaviour. Thank you for reply in any case. 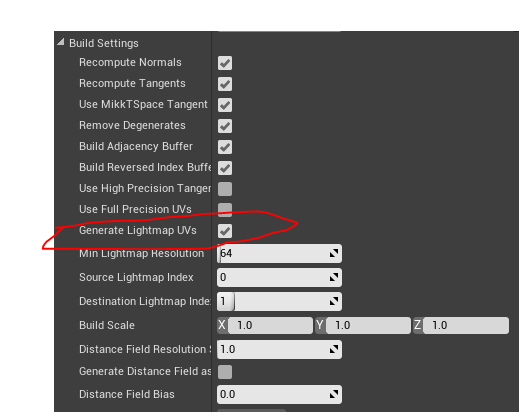 By the way, is there then some way maybe to remove lightmap or replace it inside UE4 editor? ue4's bsp is for volumes and blocking out only, its not and will never be a replacement for modelling tools. therefore you will need a modelling program like blender (free) to create new meshes. You can generate one from within UE4, but I assume you already did that. You can also export this static mesh to an external 3D program and add the light map like that. It was generated automatically I assume, when I clicked "convert to static mesh", because I didn't see any kind of settings for generated lightmap or even notification that it will be generated. Is there a way for some manual setting inside UE4? As for 3D programm, if I won't be able to find any workarounds it seems that I'll have to use it. Ah, this place. Yes, I tried to uncheck it, but it doesn't help, two shadow lines still present.